For the 12 million people worldwide who suffer from polycystic kidney disease (PKD), an inherited disorder with no known cure, a new treatment option may be on the horizon. PKD is a condition in which clusters of benign cysts develop within the kidneys. They vary in size, and as they accumulate more and more fluid, they can become very large. Among the common complications of PKD are high blood pressure and kidney failure. 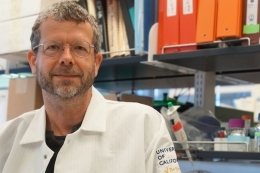 Now, Thomas Weimbs, a professor in UC Santa Barbara’s Department of Molecular, Cellular, and Developmental Biology, has developed a novel strategy for targeting therapeutic antibodies to polycystic kidneys. He notes that the strategy opens up the possibility of repurposing a large number of existing drugs for PKD therapy. Therapeutic antibodies — a class of biologics — are already being used extensively to treat a variety of diseases from cancer to autoimmune disorders. These biologic therapies use an antibody class called immunoglobulin-G (IgG) to bind to and prevent the activity of specific proteins or growth factors. However, in PKD, the growth factors shown to promote cyst growth reside in fluid trapped in the interior space of a cyst, called a lumen, to which IgG antibodies have no access. Weimbs and his team have found a method that enables another class of antibodies, immunoglobulin-A (IgA), to penetrate the cyst wall. The researchers’ results appear in the Journal of Biological Chemistry. Weimbs, who has been working on PKD for more than a decade, had an aha moment when he remembered his previous research as postdoctoral scholar at UC San Francisco. This research dealt with the question of how IgA could cross a cell layer by binding to polymeric immunoglobulin receptors (pIgR). Earlier work Weimbs conducted at UCSB had shown that the transcription factor called STAT6 is overly active in PKD, and he also recalled that STAT6 had been shown to drive the expression of pIgR in other organs. The key is using molecular cloning to reformat an existing IgG antibody to IgA. Then the pIgR system carries the IgA antibody inside the cyst, where it neutralizes a specific receptor.